I was writing earlier this week about the Limerick Soviet and a plaque on Jack Monday’s coffee shop that recalls the clashes at Thomond Bridge almost a century ago, less than two years after the October Revolution began in Russia on 7 November 2017. Thomond Bridge links Castle Street and the old mediaeval Englishtown of Limerick with Thomond Gate, High Road and Clancy Strand. 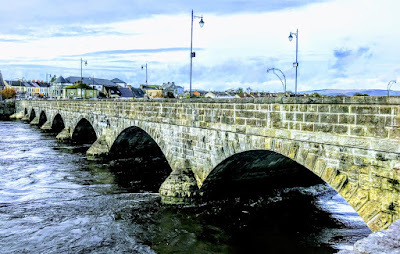 The earliest bridge on the site of Thomond Bridge was built near a fording point of the River Shannon. The bridge was probably built about 1185, making it the first and oldest bridge in Limerick. It was built to link King John’s Castle and the mediaeval city of Limerick Castle with the Thomond or Co Clare side of the river. This was once the only bridge crossing the Shannon at Limerick. But the original bridge collapsed in 1292, killing 80 people. The bridge was then rebuilt with 14 unequal arches, and over the centuries, the bridge has been rebuilt several times. In the late 17th century, Thomond Bridge was the scene of a failed defence of the city during the Siege of Limerick. 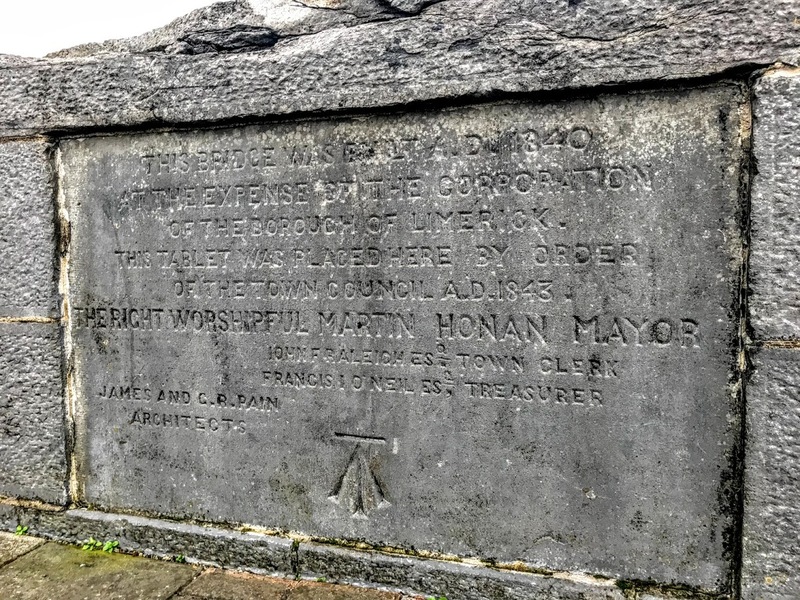 At the Thomond or Co Clare end of the bridge sits the Treaty Stone, which was moved from its original place in Thomondgate and is now a symbol of the city. But despite the legends and myths surrounding the Treaty Stone, the Treaty of Limerick was probably signed in a campaign tent. The bridge of the 18th and early 19th century had 14 arches. That bridge is the setting for many tales about Limerick told by Michael Hogan (1828-1899), the poet known as the Bard of Thomond. These include ‘The Bishop’s Lady,’ a story of a woman who would throw late-night walkers over the bridge to be drowned in the river. My lips with Limerick’s wrongs – with Aughrim’s woes? But the bridge was regularly subject to flooding at high tides, and was replaced by the present bridge, built in 1836-1840. It was designed by the brothers James and George Pain. 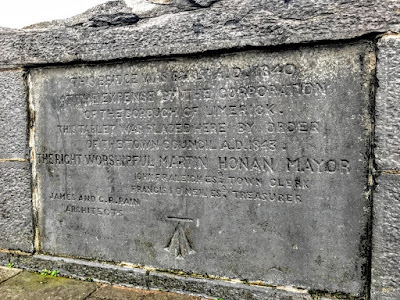 They designed many other buildings in Limerick at the time, including the County Courthouse, the Custom House and many churches and rectories. This is a seven-arch rock-faced limestone bridge, with pointed curved breakwaters and short quadrant abutments. The masonry parapet rises from a rock-faced platband, with a hammered limestone ashlar face to the road side, and a rock-faced finish to river side, ending in continuous rock-faced coping. The bridge has rock-faced voussoirs and spandrels and half conical limestone ashlar breakwaters. This bridge was built AD 1840 at the Expense of the Corporation of the Borough of Limerick. This tablet was placed there by order of the town council AD 1843. The Right Worshipful Martin Honan Mayor John F Raleigh Esq Town Clerk Francis O’Neil Esq Treasurer James and GR Pain Architects. Beneath the inscription there is a benchmark. The present bridge, designed by the Pain brothers to replace earlier bridges, is now part of the R445, formerly the N7, carrying traffic through Limerick on the Northern Relief Road. Very nice article with a lot of new information for me while I am writing a book about King James II and King William III who occupied Limerick and agreed here for peace.